A runner moves past a group of police officers gathered near the finish line of the New York City Marathon on Nov. 6, 2016. Authorities are increasing the number of officers and other law enforcement personnel for this year's race, in the wake of Tuesday's terrorist attack in the city, in which a truck struck and killed eight bicyclists. 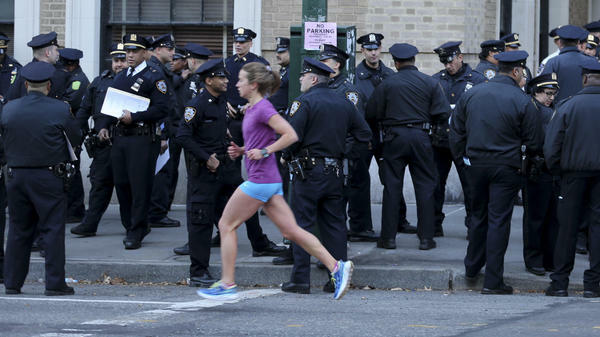 As investigations continue into the terrorist truck attack in New York City that left at least eight people dead and several more injured on Tuesday, officials are shoring up security for Sunday's kickoff of the New York City Marathon. With more than 51,000 runners expected, the annual 26.2-mile race is one of the largest in the world. As many as 2.5 million spectators could be along the race route. In preparation, the New York Police Department has added more sand trucks and vehicles along the course — the most ever deployed at the event, according to Carlos Gomez, NYPD's chief of department. He said they have more than doubled the number of rooftop observation teams and counter-sniper teams, and there will be more heavy weapons teams and police dogs throughout the city as well. "This increase will supplement the already large, substantial detail of uniformed officers that you'll see along the route," Gomez explained. "But there will also be officers in civilian attire that you won't see — they'll be mixing in with the crowds to detect any suspicious activity." New York City Mayor Bill de Blasio told NPR's David Greene Thursday that he felt confident about the race. "It's an event that we have to make happen [not just] for our people, but for the whole nation," he said on Morning Edition. "We're going to have a tremendous amount of security in place, and New York City will move on, and with something we want to show the world — that we're going to keep going." Later in the day, some of the runners picking up their race bibs at the Javits Center expressed concern, but said they would not skip the marathon. "After dedicating the last four or five months of my life towards this, not running it isn't an option," said Jude Bernard, an entrant from Brooklyn. "But I am conscious and I am aware." Bernard said his usual race worries were about having to go to the bathroom, getting hurt or getting cramps. "This was the first year I said to myself, 'I hope there's not a terrorist attack or something unforeseen or something crazy happens,' " he said. "Nonetheless, you can't live life in fear. You know, you have to get up every day and live as if it's your last day — because it just might very well be your last day. And you can be aware, you can be conscious, but you can't hide under a rock and hope ... that nothing happens." Conny Brucker, who traveled from Freiburg, Germany, for the marathon, was afraid it would be canceled. She pointed to the terrorist attacks in Europe and said it was important to show that people in New York were not afraid. "I can go wherever in the world and I could always be a target," she said. "You cannot stop [terrorists] from doing this. I go on, do the race, hope that I'm safe."